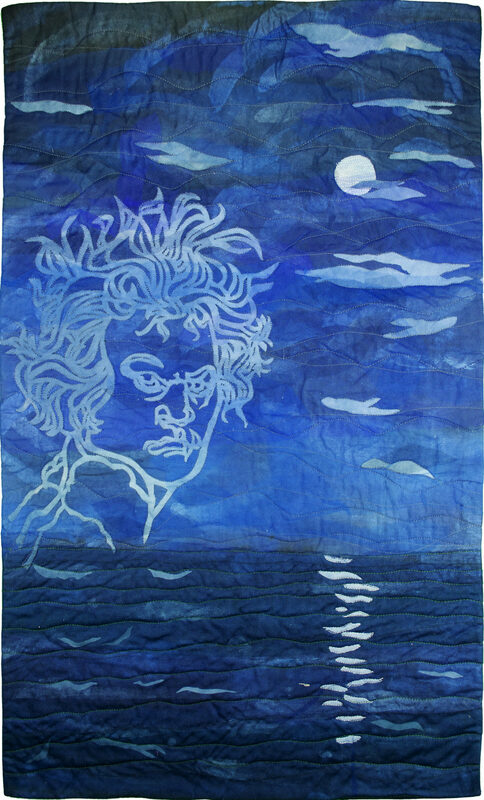 The quilt was inspired by Ludwig van Beethoven’s Piano Sonata No. 14 in C-sharp Minor, Op. 27, No. 2: Sonata quasi una fantasia, more popularly known as the “Moonlight Sonata.” The sonata, completed in 1801, and published the following year, has always reminded me of ocean waves and incoming tide with its repeating triplets in the first movement. The sea is peaceful at first, but a storm rolls in during the second movement, and provides a bit of thunder and lightning in the third. My interpretation of the music captures a point in time where there are a few clouds moving in, but the moon is still visible, casting its reflection on the water. 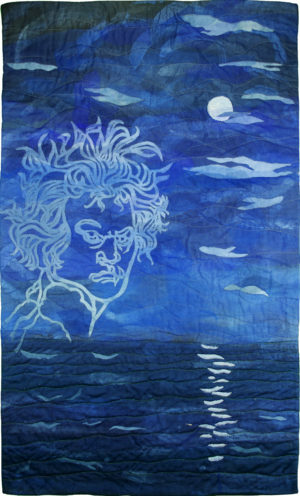 Beethoven, rather a stormy personality himself, watches in the clouds. After the storm, the ocean will return to its former calm, and the cycle of tides, seasons, and weather will begin anew. Hand dyed cotton fabrics, textile paint, netting.